Overwhelmed? Check out these 3 tips to be a productive mom. If you aren’t doing these things already, you NEED to be! As the days tick by and I realize I’m no longer a “new mom” but more just a mom with a toddler with a second baby on the way. I’ve realized that it’s time to get organized in this new role of mom and figure out how to do life in my new normal. I’m no longer tied down by 40 hour a week job or a structure like college life handed me. Instead, I work 3 part-time jobs from home mainly while calling myself a full-time stay-at-home mom. It’s been quite the battle within myself figuring out how to make it all work. I’m not going to lie. Some days are tough. I mean really tough. This month is crazy town and I feel like my poor sweet 20 month old gets put on the back burning as I rush to meet deadlines I’ve set for myself and to get everything done I’ve committed to. But then there’s the days where I schedule in play time. We go to the park. We go for long walks. We say yes to a play date I usually would say no to. Those are the days where I remember it’s all worth it! 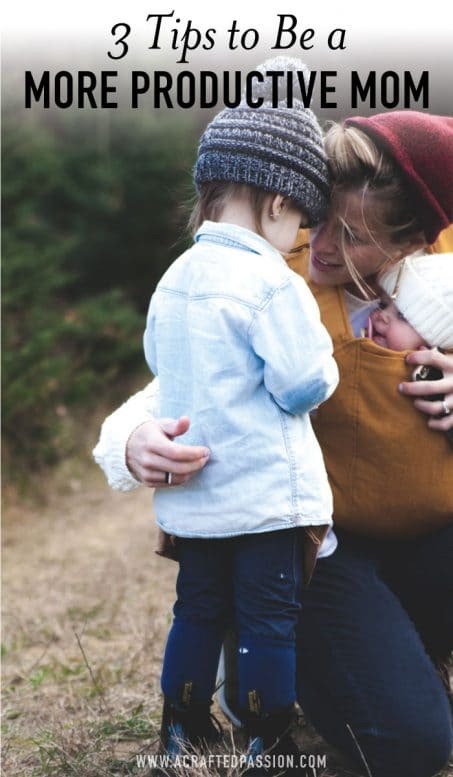 Over the last few months I’ve worked really hard to find a new life balance and today I want to share with you 3 ways I’ve learned to be a more productive mom and I hope something I share might hit home with you. Even if nothing resonates, know that I’m with you. We’ve all been there. Days can be tough as we count down the seconds before daddy walks through the door. Here’s just a few things I’ve learned that helps me keep my sanity. As soon as we say “nigh-night” for naptime I head to the couch and crash. Thirty minutes later I realize I’ve scrolled through my whole Facebook feed and am now mindlessly working my way through Instagram. Without having a plan I find myself lost and wasted so much time. Next thing I know I start to hear her stir and realize the whole naptime was wasted. Think about what are your priorities and write them down. It helps to see it on paper so you don’t forget. I’m going to admit, some days it doesn’t happen. Some days I pour a cup of coffee, sit down on the couch, and turn on Hoda & Kathie Lee. Most days though, naptime is my absolute most productive time of the day and when I get the most work done. I’ll probably write a post on it down the road but I recently installed RescueTime and it has been so eye-opening seeing how much time I actually spend on my computer each day. Confession: I average 7-11 hours a day on my laptop. Eeek! No wonder my eyes hurt by the end of the night. It’s been so helpful seeing where I spend my time though and if I’m being productive or getting distracted with trivial things (like Facebook or reading the latest article tease on the new Gilmore Girls episodes). So, try it out. Make a checklist. It will help you feel more productive and help you feel better when you’re sitting reading a book with your little or coloring at the table rather than worrying about your growing to do list. Yes. I’m serious! This has been huge for me! Schedule in free time. Whether that’s a girls night or telling yourself you’ll read a book this week. Set time aside for you. As a Type-A personality, I always have a to do list a mile long and have a really hard time putting time aside for myself where I can turn my brain off and just veg. Those times when I do sit and watch a movie without my computer screen staring back at me the whole time is the best. Try it. I think you’ll like it and I’m sure your kids will too. Now, this one has also been a huge game changer for me. Along with my naptime checklist and scheduling free time, I need a place to remember these things. Get yourself a planner — or a calendar app that syncs with your phone and computer — and commit to using it for a month. Change is hard, but once you get in the habit of using it, it can be so freeing! I realize I’m less stressed trying to remember all the little things I need to do because I know all I need to do is look at my calendar and it’s all laid out right in front of me. I’ve cleared up more space in my brain to be creative and relax. Personally, I use Google Calendar so it easily syncs with my phone and I have a joint calendar with my husband so we can share events that he needs to know about, but I envy all the people who use the darling planners filled with colored pen doodles and washi tape. 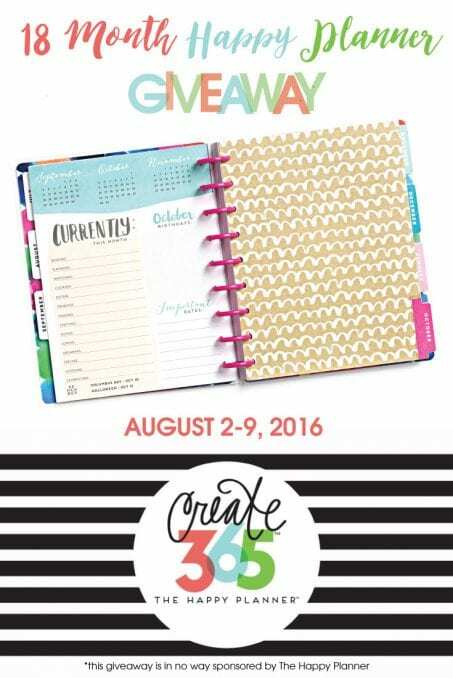 Lucky for you though, I’m excited to give away one of these Create 365 18-month Happy Planner’s to one of you! Help yourself get more productive and be a better mom with this brand new planner. Confession: I meant to do this giveaway a month ago but I totally forgot (clearly the detailed calendar is a new found love) and this planner is good for July 2016 – December 2017. But it’s still brand new, looks gorgeous, is filled with creative and inspirational artwork, and will help you stay organized. You can see more all about this planner here. To enter just follow the instructions below. This giveaway closes Tuesday, August 9, at 11:59pm PST. One winner will be chosen at random and notified within 24 hours. They will have 48 hours to reply before a new winner will be chosen. Only open to USA residents 18 years of age. Do you have tips to be a productive mom? If you found this post helpful, I’d love for you to share with your friends using the sharing links below! To Our Favorite Daddy + An Announcement! What a gorgeous planner! And I agree with all of these, Amanda! Our kids don’t nap anymore but I totally can waste the time away! Thanks for these! Agree with these Amanda, planning work and play makes it much easier to feel that you’re more present. I prefer to make a quick list in the morning and work through them – it allows me to shift things around a bit and I also prefer working at night after my little one is asleep. Love this list. I am implementing the naptime checklist stat!